Have you ever read a story and asked yourself how it would have ended if you had been in place of the main character? 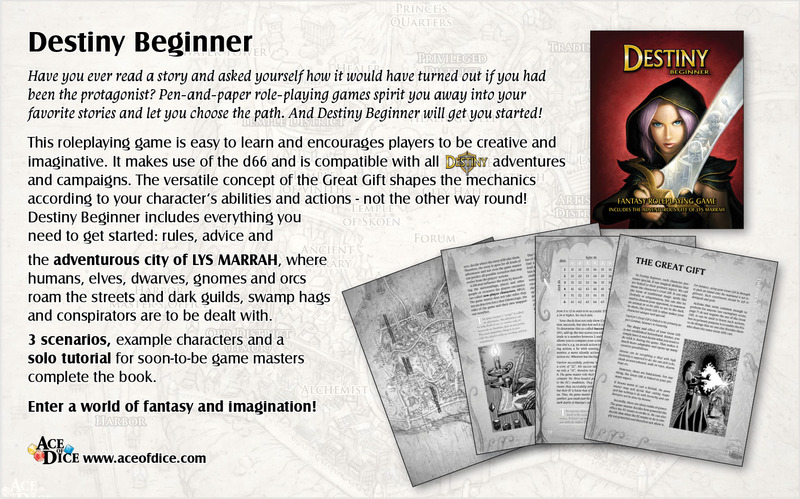 In Pen&Paper-Roleplaying you can do just that, and Destiny Beginner can get you started in no time! Get it NOW at drivethru/rpgnow! 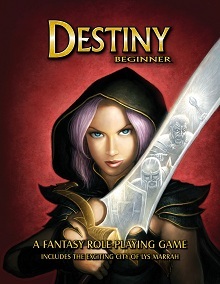 Destiny Beginner is a fantasy roleplaying game for beginners and advanced alike if they have a penchant for narrative gameplay. It consists of a rules chapter which features many examples and covers even general topics such as how to be a game master and how to design and structure an adventure. The special concept of the Great Gift enables you to play any character, any race, class or profession. The rules really bend to your imagination, not the other way round! Create your character in less than 5 minutes. Take on challenges with swords, brains and magic. Make use of the versatile dice mechanics and rules that support your creativity. Destiny Beginner is fully compatible with all Destiny products. the bustling city of Lys Marrah, in which elfes, dwarves, gnomes and orcs roam the streets and are bound to each other by a fascinating web of dependencies and conflicts. This is where you fight against dark guilds, evil hags and well disguised conspirators. 1 game master solo, in which starting game masters are being guided through exemplary situations and being shown how to deal with bored players, unexpected character actions and the like. Support this game by buying it at Drivethru/RPGnow!